Only 45 calories per slice. No high fructose corn syrup. 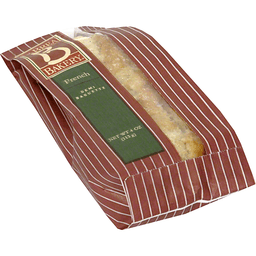 Per 1 Slice Serving: 45 calories; 0 g sat fat (0% DV); 105 mg sodium (5% DV); 1 g sugars. 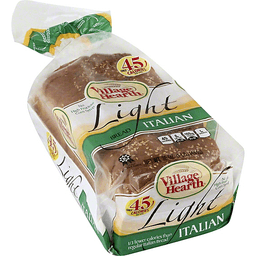 Village Hearth Light Italian Bread contains 45 calories and 0.5 grams of fat per 0.80 oz slice (23 grams) compared to Regular Italian Bread which contains 70 calories and 1.0 grams of fat per 0.80 oz slice (23 grams). We can all make a difference! (Even the twist tie that we used on this package is certified as completely biodegradable.) Plastic bags are recycled into many different products. Most plastic bags are recycled into composite decking but can also be reprocessed into post consumer resin which can be recycled into a variety of products such as new bags, pallets, containers and crates. Go green. Please recycle me with your grocery store bags. 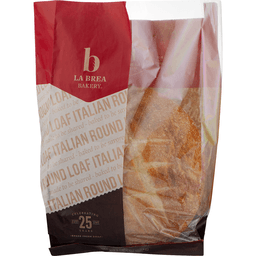 Village Hearth Light Italian Bread has a full slice and is baked with all of the good taste of regular Village Hearth, however, the Light Italian bread contains fewer calories and is higher in total dietary fiber. Village Hearth is a family owned company with a proud heritage dating back to the 1800s! 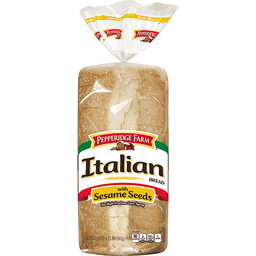 Our entire line of breads is made with only the finest ingredients. Try the other delicious Village Hearth Breads. You'll find them in the Village Hearth section at your favorite store. Always healthy for you. This product does not contain high fructose corn syrup; artificial colors/dyes; bleached flour; l-cysteine; cholesterol; Azodicarbonamide (ADA); trans fat. 1/3 fewer calories than regular Italian buns. Only 80 calories per bun. No high fructose corn syrup. 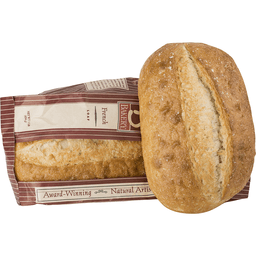 Per 1 Bun Serving: 80 calories; 0 g sat fat (0% DV); 190 mg sodium (8% DV); 2 g sugars. Calorie Content per 48 Gram Serving: Regular Italian bun = 120 calories. 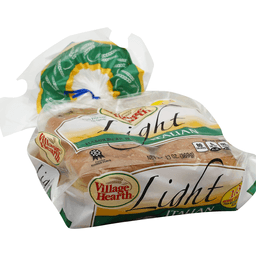 Village Hearth Light Italian bun = 80 calories. We can all make a difference (Even the twist tie that we used on this package is certified as completely biodegradable)! Plastic bags are recycled into many different products. Most plastic bags are recycled into composite decking but can also be reprocessed into post consumer resin which can be recycled into a variety of products such as new bags, pallets, containers and crates. Go green. Please recycle me with your grocery store bags. Village Hearth Light Italian buns are baked with all of the good taste of regular Village Hearth, however, the light Italian bun has been made with a special recipe to have the calorie and dietary fiber levels many of our customers want. Village Hearth is a family owned company with a proud heritage dating back to the 1800s! Our entire line of buns is made with only the finest ingredients. Try the other delicious Village Hearth products. You'll find them in the Village Hearth section at your favorite store. Always healthy for you. This Product Does Not Contain: high fructose corn syrup; artificial colors/dyes; bleached flour; L-cysteine; cholesterol; azodicarbonamide (ADA); trans fat.